How do I get support for a simulator? Students should review the FAQs below and report issues or concerns with a simulator to their lab technician or instructor. Review the FAQs below to see if they address your question or problem. 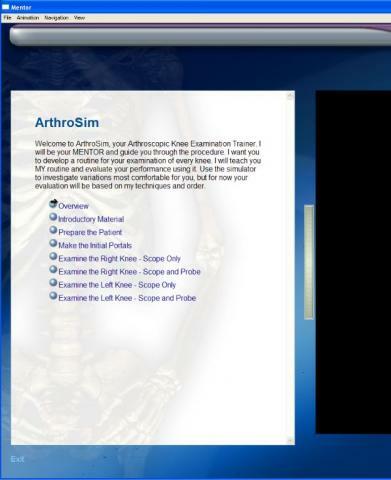 How do I start my task on ArthroSim? When starting the ArthroSim for the first time we recommend starting with reading the "Quick Start Instructions." These will show you how to correctly calibrate the tools which is important to set the tools for all tasks. Next we recommend going through the entire "Overview" in the Mentor, which is on the left screen. The Overview will orient you with the ArthroSim, the Mentor, the tools, and the camera. Familiarizing yourself with each of these items is imperative to using the ArthroSim correctly and more importantly will assist one in practicing each procedure and passing each exam. Below are instructions to get to the Overview. From the Mentor's Main Menu (see image below) select Overview. 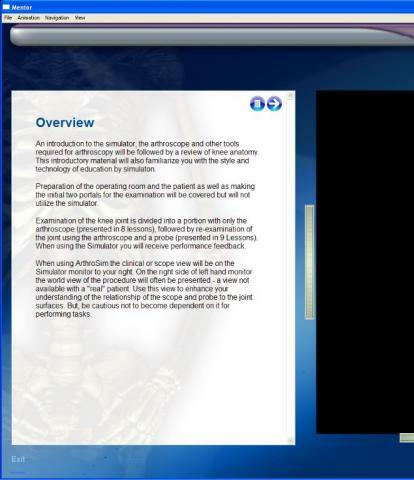 Below is the first screen of the Overview. Utilize the arrow in the upper left corner to navigate through the Overview. On ArthroSim, how do I restart my task without shutting down the simulator? 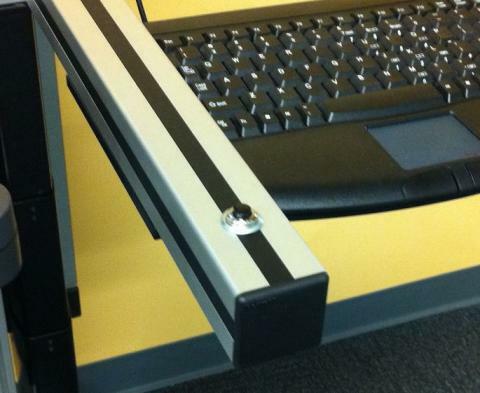 To restart your session without shutting down the simulator, locate the black reset button on the right arm of the ArthroSim stand (see image below). Press this button to reset your session. Note you will be prompted to re-calibrate the tools following the use of the reset button.